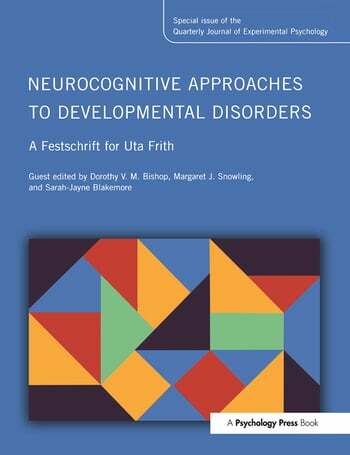 Uta Frith has been an outstandingly influential figure in the field of developmental neuropsychology for over 40 years, and is internationally renowned for her work on developmental cognitive disorders. Her scholarly influence has defined contemporary research on atypical development, notably in the fields of autism and dyslexia. This tribute to Uta brings together her former graduate students, post-doctoral scientists and collaborators in a series of papers that provide reflections on current theory and research. The volume bears the hallmark of Uta’s mentoring by including critical ‘state of the art’ reviews, empirical research which challenges mainstream views and consideration of alternative hypotheses that set the stage for future research. Topics covered include behavioural and neuroimaging studies of autism, dyslexia, psychopathy, as well as theoretical and experimental accounts of normal and abnormal development of intelligence, reading and social cognition. This special issue of the Quarterly Journal of Experimental Psychology will be of interest to all students and researchers in the area. Bibliography: Publications by Uta Frith. D.V.M. Bishop, M.J. Snowling, S.-J. Blakemore, Editorial. D.V.M. Bishop, Forty Years On: Uta Frith’s Contribution to Research on Autism and Dyslexia, 1966–2006. B. Sodian C. Thoermer, Precursors to a Theory of Mind in Infancy: Perspectives for Research on Autism. S.-J. Blakemore, Development of the Social Brain During Adolescence. F.G.E. Happé, R.D.L. Booth, The Power of the Positive: Revisiting Weak Coherence in Autistic Spectrum Disorders. S. Baron-Cohen, Autism, Hyper-systemizing, and Truth. J. Perner, S. Leekam, The Curious Incident of the Photo that was Accused of Being False: Issues of Domain Specificity in Development, Autism, and Brain Imaging. F. de Vignemont, Frames of Reference in Social Cognition. A. F. de C. Hamilton, Emulation and Mimicry for Social Interaction: A Theoretical Approach to Imitation in Autism. M. Anderson, What can Autism and Dyslexia Tell Us About Intelligence? F. Ramus, G. Szenkovits, What Phonological Deficit? M.J. Snowling, Specific Disorders and Broader Phenotypes: The Case of Dyslexia. R.J.R. Blair, Fine Cuts of Empathy and the Amygdala: Dissociable Deficits in Psychopathy and Autism. E. Viding, A.P. Jones, Cognition to Genes via the Brain in the Study of Conduct Disorder.